Good. 0140150358 Unmarked text. Cover corner creased. Fine. Signed by previous owner. SHIP DAILY from NJ with tracking; USED, NEAR FINE to VERY GOOD (pages toning, very minimal underlining (pen only), name on end page, glossy) AS SHOWN THIS COVER. Trade paperback (US). Glued binding. Viking Portable Library. Audience: General/trade. 15718 15718--Anton Chekhov remarked toward the close of his life that people would stop reading him a year after his death. But his literary stature and popularity have grown steadily with the years, and he is accounted the single most important influence on the development of the modern short story. Edited and with an introduction by Avrahm Yarmolinsky, The Portable Chekhov presents twenty-eight of Chekhov's best stories, chosen as particularly representative of his many-sided portrayal of the human comedy--including "The Kiss, " "The Darling, " and "In the Ravine"--as well as two complete plays; The Boor, an example of Chekhov's earlier dramatic work, and The Cherry Orchard, his last and finest play. 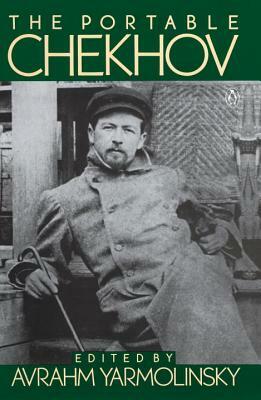 In addition, this volume includes a selection of letters, candidly revealing of Chekhov's impassioned convictions on life and art, his high aspirations, his marriage, and his omnipresent compassion. Penguin Books, 1979. Very good., Paperback, 12mo, 634. Text clean. 634 pages. Light wear. Twenty eight stories, two complete plays. Selections from his letters. Edited with an introduction by Avrahm Yarmolinsky. New or revised translations; new bibliographies. Packed and shipped with care.